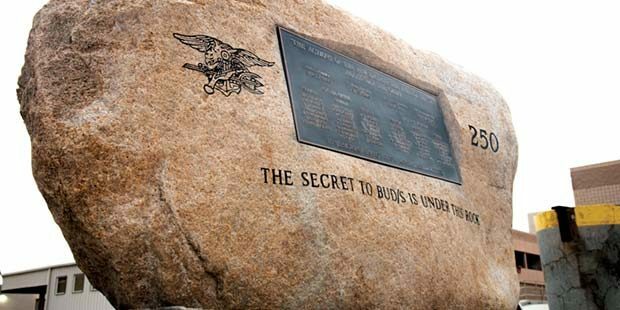 The secret to BUD/S is under this rock” is engraved on a 2,000-pound boulder that rests in a curious location. Just before graduating 2004, students from Basic Underwater Demolition/SEAL (BUD/S) class 250 worked as one, in the shadows to move the colossal stone from some unknown location to the middle of a parking lot at Naval Special Warfare Center, home to the BUD/S training facility. Traditionally, BUD/S classes leave behind “gifts” for the instructors, command and future BUD/S classes. This massive stone is the gift from the class that included Medal of Honor recipient Petty Officer 2nd Class (SEAL) Michael A. Monsoor, who was killed in action Sept. 29, 2006. According to Deshazo, a group of the shortest members of class 250, or “Smurf Crew,” bumped into the stone while out in San Diego bay. One of the brave “Smurfs, from Santa Barbara, California, who had been tempted by mermaids before,” held onto the rock for dear life while the other members attempted to follow the mermaid who made promises of warm beds and hot coffee. The mermaid’s spell was broken when a BUD/S instructor kayaked by while combing his mustache. The crew brought the now-sacred boulder back to venerate it as an object of devotion, it is believed. 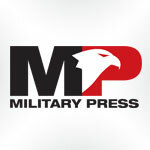 Another, more plausible rumor from an undisclosed source, states that unidentified members of class 250 found the boulder in the desert and loaded it into a truck late one night. They brought it back to San Diego and placed it in the command parking lot as a gift. There are as many stories about the boulder’s origin as there are answers to what the secret is hidden below the rock. It would take a bulldozer, or a large group of very motivated BUD/S students working together to find out what is actually under the boulder. Some say there is no secret to becoming a Navy SEAL and that there’s nothing under the rock, while others say the secret is teamwork. However, everyone seems to agree that the boulder and its myths inspire and encourage everyone who comes across it. Regardless of how or why, the placement of the boulder was the first of many great feats to come from graduates of class 250, which include the acts of selfless courage of Monsoor and Chief Petty Officer (SEAL) Jason Ray Workman, also killed in the line of duty. The USS Michael Monsoor (DDG-1001), the second Zumwalt-class guided-missile destroyer and namesake to the most prominent member of BUD/S Class 250, was commissioned during a ceremony aboard Naval Air Station North Island on Jan. 26.